The New Forest National Park is a stunning place for camping in the New Forest with its utterly preserved natural beauty, teeming with wildlife, flowers, streams, ancient trees and rolling green farmland. Attracting thousands of visitors every year, people flock to the first national park in the South of England, revealing in the peaceful, tranquil surroundings that harp back to ancient times. It’s the only part of South East England that’s preserved and protected from modern development, with its landscape probably still navigable by the likes of William the Conqueror, who used to hunt there hundreds of years ago. Without visiting the area and seeing for yourself what majestic England looks and feels like, you’ll never truly grasp the beauty of it. 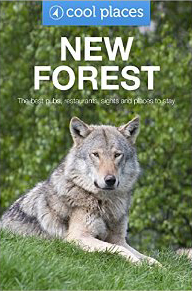 So if, like many, you’re planning a trip to the New Forest to see it for yourself, then you may well be looking for somewhere to stay - and where better to stay then right in the heart of it, at one with nature? Camping in the New Forest Hampshire is extremely popular in the New Forest National Park, and there’s a host of great campsites for you to pitch your tent. There’s literally something for everyone, with basic and luxury campsites, caravan sites and even log cabins. Forest holidays has ten stunning campsites, most without facilities, so you can truly immerse yourself in the outdoors. 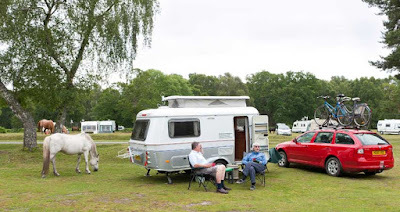 Aldridge Hill, for example, is a natural camping and caravan site with no facilities, located in a heathland clearing and bordered by Ober Water and Blackwater Stream. Then there’s Ashurst, popular amongst many campers for providing a great taste of the best of New Forest, set in a stunning woodland glade and failing to disappoint. If you’re looking to surround yourself with old oak trees, Denny Wood, Matley Wood, and Setthorns are all fantastic, set in grassy clearings amongst scattered oaks and entirely secluded - affording you true tranquility and privacy. Hollands Wood is also a great site if you’re looking to surround yourself with oak trees and is the winner of the David Bellamy Silver Conservation Award. 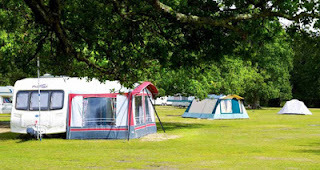 Travelling with kids can be tough if you can’t keep them entertained, but Holmsley camping and caravan site is just a short drive from the beaches of Christchurch and Bournemouth, and the grassland site has plenty of space for them to play too. If you’re looking for an open heathland site with plenty of blue sky, space (and toilets!) then Ocknell Caravan Park and Camping Site is for you, whilst Longbeech site is tucked away nearby in the midst of an ancient beech wood and is facility free. Roundhill Caravan Park and Camping Site is perhaps the best option if you’re staying with the whole family, with the spacious heathland site offering refurbished facilities and more than enough space for the children to run around. If it’s real luxury that you’re looking for though, then perhaps somewhere like Sandy Balls Holiday Centre would suit you. Nestled in 120 acres of breathtaking woods and parkland right on the border of the legendary River Avon, this all year round holiday park offers a whole host of guest facilities. Quite literally everything you could wish for is catered for here - with accommodation ranging from fully serviced touring and camping pitches to ReadyTents and luxury cabins. There’s indoor and outdoor swimming pools, an entirely indulgent beauty suite, stunning onsite restaurants and bistros in the newly refurbished central pedestrianized piazza, and even a state of the art gym! Hire a bike and go cycling through the woods, or take a leap and go horse riding - you name it, you can do it here in style. There’s something for everyone in the New Forest National Park, and even in the most luxurious and modern of venues the emphasis is always on organic, back to nature living. You won’t regret a trip to this amazing destination, and whether you opt for the basic facility free nature sites or the luxury, facility loaded holiday parks, there’ll be no doubt in your mind that your holidaying in a place of genuine and valued prehistoric natural beauty. Below are descriptions and links to websites giving you full details about camp sites in the New Forest. Hope you find and enjoy that perfect holiday. Camping in the Forest has 10 New Forest campsites, each brimming with natural beauty. Book your next trip online today and try New Forest camping with us. The New Forest campsites are a haven for campers and caravanners and we are spoilt for choice with our New Forest Holiday Parks, providing excellent services and hospitality. Covering swathes of south west Hampshire, the New Forest, despite it’s name is almost a thousand years old. Miles of open heath and thick woodland are the ideal backdrop to any holiday and if you dream of camping in a peaceful hideaway, the New Forest is the perfect escape. Thousands of details of campsites, retailers, free classified ads, a message board, weather forecast, camping articles and newsletter plus loads more. Our ten picturesque New Forest caravan and camping parks are all located deep within beautiful woodland. New Forest camping at Long Meadow Campsite, New Forest National Park. Peaceful 18-acre site, 100 spacious pitches (28 with electricity). All our pitches are on grass, 45 of which have electrical hook ups. Our shop, which is open 7 days a week. The modern toilet block has underfloor heating for the cooler months. Enjoy some great New Forest camping with a choice of ten official campsites. Complete listing and info here. A selection of Camping and caravanning sites in the New Forest National Park. These sites offer excellent locations within the heart of the Forest. Choose from 5-star luxury lodges, caravans, camping pods or award-winning touring and camping pitches. A National Park since 2005, the New Forest offers a slice of largely wooded England that has changed little since it was created in 1079. Relatively flat and criss-crossed with gravel tracks, footpaths and even a disused railway, the woodland and open heathland is perfect for walking and cycling. The park also supports a healthy population of wildlife, including deer and its most famous residents, the New Forest ponies, which roam at will. The forest also flanks a large section of coast, and although much of it is outside the park proper, you’ll find some great beaches and harbour towns nearby. The best of these is Lymington, once a haunt of smugglers and now a yachties’ favourite and gateway to the Isle of Wight.